OpenDrop V2 is an updated design for an open-source digital microfludics platform, which was initiated by GaudiLabs in Luzern, Switzerland and developed in collaboration with several communities including hackteria | open source biological art, BioFlux and digi.bio. The device is part of a much larger ecosystem focused around digital biology with hopes of making personal lab automation accessible to everyone. OpenDrop runs on a technology called “electrowetting” to control small droplets of liquids across a special PCB covered with a hydrophobic film. Pads on the PCB are driven to high voltages to attract the droplets, so moving them is simply a matter of controlling which pads are charged. 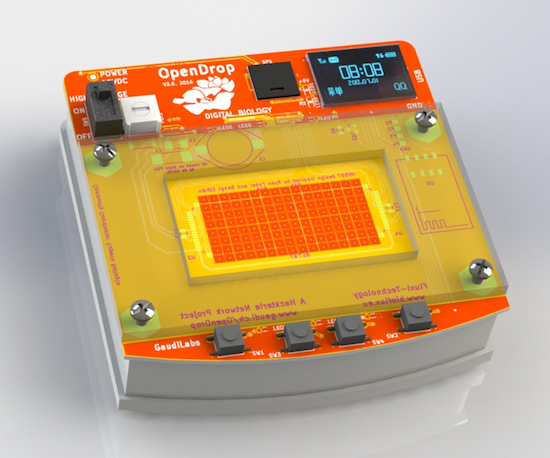 In terms of specs, OpenDrop features an Arduino Micro, two HV507 high voltage drivers, a 16×8 electrodes array, four buttons, a tiny OLED Display, a WiFi module, LEDs, liquid connection ports, and a micro USB slot. Potential applications are not only limited to science, but the art, music, gaming and education fields as well. One such example is OpenDropper, an 8-bit video game. See it below! Interested in learning more? You can read all about the open-source microfluidics platform here and find its files on GitHub.